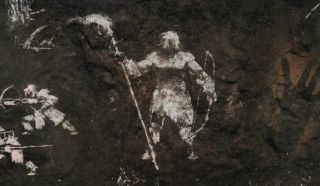 Ubisoft is teasing an imminent announcement of something on its YouTube channel with what appears to be a livestream of a cave painting. Seriously, at this moment, that's all we've got: A cave painting of a man—or man-like creature—holding a bow and large torch, or perhaps a spear, while in the background, another bowman and a spearman appear to be leaning toward off-screen prey. There's also a silhouette of a hand, sparks flying from a fire, and ominous, primitive music. A caveman Far Cry—Far Cro-Magnon, perhaps? Or could it be Raving Rabbids: Travel in Time 2? A BC's Quest for Tires reboot? Has Ubi bought out the Ark: Survival Evolved guys? Or is it something entirely new? Update: It's not official, but Ubisoft's big announcement, as unintentionally revealed by the IGN Turkey Twitter account, is a new Far Cry game called Far Cry Primal. The post itself is gone, but the tweet remains, along with an image that bears, to my mind at least, a more-than-passing resemblance to the bizarre Zeno Clash. We're still waiting for the word from Ubisoft, but there you have it: A new and potentially very interesting take on Far Cry is on the way.